Seventy five years ago, on November 2 1936, the world's first high definition TV service was created. It was a momentous occasion, but the road towards it had been rocky - corporate uncertainty, government intervention, multiple egos, and a race against time. But eventually history was made at Alexandra Palace [pictured]. Why Alexandra Palace? It was chosen mainly because of its location, high above London, but also because of the time scale of the project: at a mere 18 months, it was deemed cheaper, easier and quicker to convert an existing building than to build a new one. So 'Ally Pally' - as it was named by an early TV performer Gracie Fields - with its extraordinary TV tower, became the iconic visual for 1930s TV. Then began the race for TV. Two competing systems were to be tested for six months in two different studios. In studio A was the Marconi-EMI system, all electronic on 405 lines. It had the advantage of being flexible: three cameras could be accommodated and, most importantly, could be moved on wheeled dollies to follow the action and provide close-ups. Studio B housed the Baird system on 240-lines (devised by John Logie Baird), which was a mainly mechanical system, much more limited in range and capacity. Live announcements were made from a cramped 'spotlight studio' which scanned the head and shoulders of the announcer with an intense beam of light. Physically uncomfortable for the presenter, it also used a delayed form of TV known as the Intermediate Film Technique. With this system the film passed into a processing tank of cyanide where it was developed, providing a TV picture only 58 seconds later. The official opening ceremony was on November 2 1936. After the toss of a coin, the pilot programme was transmitted first on the Baird system and then, after a brief pause, the entire programme was done again live on the Marconi-EMI system. So the BBC's second television programme was also its first repeat! Within three months the decision to go with the Marconi-EMI system was made and the Baird studio at Alexandra Palace was closed down. Baird had been the best of propagandists for the new innovation of television, but as writer Rebecca West said of him, he was 'doomed to be the man who sows the seed but does not reap the harvest'. 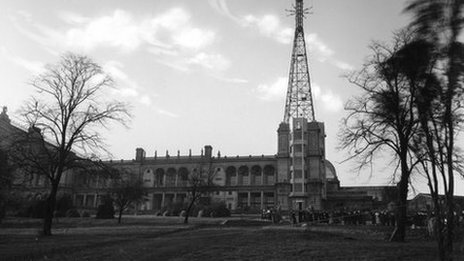 Three years later, on September 1 1939, WW2 loomed and the staff at Alexandra Palace were instructed to switch off the transmitter and close the service down for the duration. The last programme seen on air was a Mickey Mouse cartoon; when the TV service re-opened on June 7 1946, its first programme was that very same cartoon. It was followed the next day with a major outside broadcast of the Victory Parade on the first anniversary of Victory in Europe. BBC Television quickly outgrew the two original studios at Alexandra Palace. Additional studios were provided at Lime Grove and the Television Theatre, and then in 1949 the BBC purchased a 13½ acre site at White City for a future 'Television Centre'. News moved to Alexandra Palace in 1954 for a decade or so, and in 1970, the newly-launched Open University had its programme-making base there until 1981. Thirty years later, and 75 years after television started, much of the original structure is still there and it is now the earliest surviving example of a television station anywhere in the world. The men and women who worked there took television from a scientific novelty and set it firmly on the path to become the most powerful communications medium of the 20th Century. We owe a debt of gratitude to the scientists, engineers, production teams and performers who have given us such a wealth of entertainment, information and education over the last three quarters of a century.